KERRY’S TADHG KENNELLY has been hailed for his Australian Rules exploits by Sydney Swans after being inducted into the club’s Hall of Fame. Kennelly, who made 197 appearances for the club, became the 61st member inducted into the Sydney Swans Hall of Fame at a presentation on Wednesday night. In 1999 Kennelly joined the club as a rookie and established himself to enjoy an excellent career. The highlight came in 2005 when he became the first Irish-born player to win an AFL Premiership medal. There was a glowing tribute paid to Kennelly on the Sydney Swans official website. “After arriving at the Swans via a rookie contract, a very green Kennelly spent hours upon hours learning the craft and adapting to a new way of life. It was tough road for the son of a Gaelic Football champion who had never previously travelled abroad. “Kennelly was quoted as saying there were times when a one-way ticket to London was a very real possibility and, if it wasn’t for Swans’ former development coach and long-time father-figure George Stone, he would have packed up and left everything behind. Congrats to @TadhgKennelly inducted into the @sydneyswans Hall of Fame last night, Well done brother ! Some of Kennelly’s former Kerry teammates saluted him for his achievement. What a life achievement by @TadhgKennelly @sydneyswans Great team-mate, great attitude, great story. 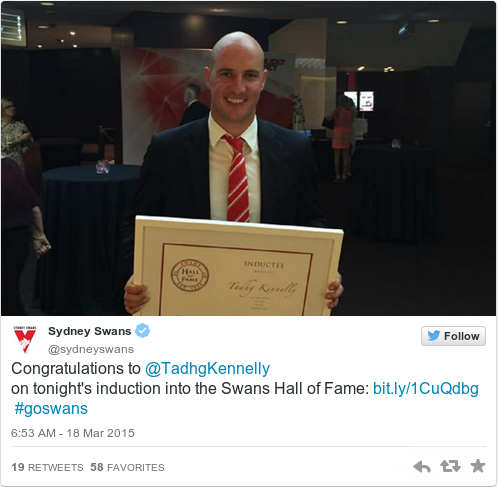 Email “Tadhg Kennelly hailed for Aussie Rules career as he enters Sydney Swans Hall of Fame”. Feedback on “Tadhg Kennelly hailed for Aussie Rules career as he enters Sydney Swans Hall of Fame”.